Back in 2011, my friend and colleague Kurt Gardiner, a Hoboken Democratic Committeeman, published this cartoon at the Hoboken Journal when Reform lived and he a fledging Freeholder candidate was vying against the HudCo Machine. Big news is breaking out all over. 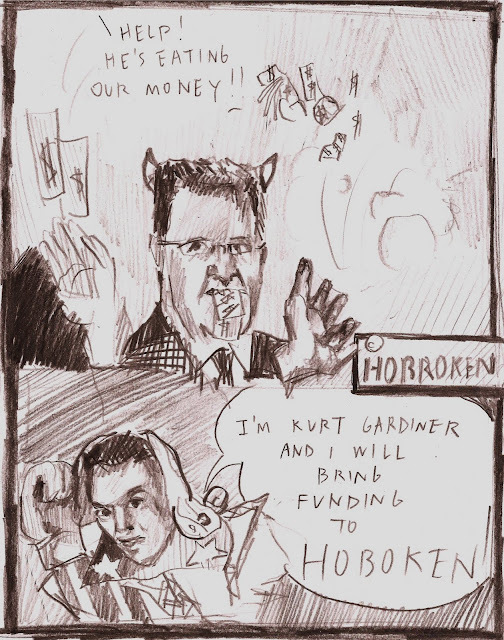 The primaries for Hoboken and Hudson County were anti-climatic less the reports from the street of an insurgent campaign on behalf of Mayor Ravi Bhalla. An untold number of people reportedly wrote-in Mayor Ravi Bhalla for Congress to propel his political ambitions forward. In West New York, Mayor Felix Roque who sided with State Senator and Union City Mayor Brian Stack's insurrection to take over HudCo saw a slaughter for Democratic committee. Stack and Roque lost fully 46 of 50 contested committee seats among 58 overall. There are reports Congressman Albio Sires held a victory party but called it a victory not for himself but for upstart Hudson Democratic Committee candidate Amy DeGise. It could be worse. SpyGate's exploding as the Russia Collusion Hoax is imploding and the HudCo civil war band played on. Related: The Hudson County View published its story on all the gory news of the outcome. It's looking rather bleak for the HudCo insurrection led by Brian Stack and his civil war allies Ravi Bhalla and Steve Fulop. Amy DeGise appears in the video of the Congressman Albio Sires victory party. In a statement she wrote, "Tonight Democrats in West New York and Harrison delivered a strong statement we will not allow our party to be taken over by the Stack machine and that we want progressive, inclusive leadership that puts everyone's interests first, not just one city's."